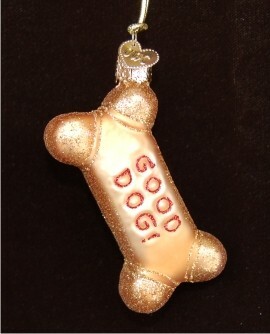 Here's a golden treat for the popular pooch in your family. The dog biscuit glass personalized Christmas ornament accented with glitter can be customized with a name and current year or year your furry friend joined the family. It's one of our dog ornaments personalized for added significance, and the good dog glass Christmas ornament arrives in our black velvet doggie bag.